Diabetes leads to impairment of the normal course of wound healing. Interestingly, recent studies have implicated a critical role of P2X/P2Y nucleotide receptors in dermal tissue regeneration and maintaining vascular homeostasis. As new vessel generation and keratinization process are decreased in diabetic patients we determined whether nucleoside 5'-O-phosphorothioate analogues might accelerate vascular endothelial growth factor (VEGF) production as well as the growth and migration of human keratinocytes under hyperglycaemic conditions. We also investigated the expression pattern of P2X/P2Y receptors in human keratinocyte HaCaT cells. We show here that nucleoside 5'-Ophosphorothioate analogues are better candidates to overcome hyperglycaemia-induced impairment of angiogenesis as compared to their unmodified counterparts. 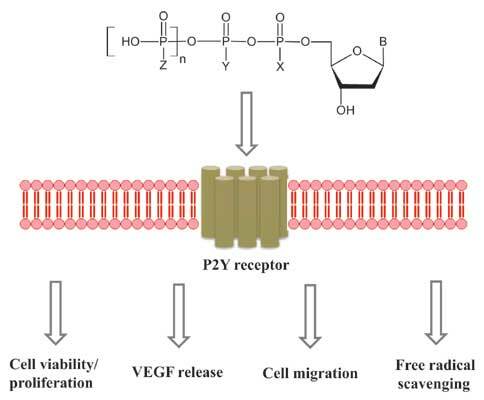 The greatest potency for VEGF release and stimulation of cell migration by thiophosphate analogues of ATP and UTP correlates with the highest P2Y2 receptor expression by HaCaT cells. We also found that UTPαS significantly increased the viability and proliferation of the HaCaT cells. These findings suggest that thiophosphate analogues of nucleotides could serve as potential therapeutic agents for promoting impaired angiogenesis under diabetic conditions. Angiogenesis, Hyperglycaemia, Keratinocytes, Nucleoside-5'-O-phosphorothioate analogues, P2Y receptors, VEGF, Wound healing. Institute of Technical Biochemistry, Faculty of Biotechnology and Food Sciences, Lodz University of Technology, Stefanowskiego 4/10, 90-924 Lodz, Poland.